Carleton Ganser was the son of Christ Ganser and Genevieve Uslemann. Carleton Ganser married Phyllis Ganser, daughter of Arthur L. Ganser and Theresa Werla. Carleton Ganser died before 1995. Eugene Ganser was the son of Christ Ganser and Genevieve Uslemann. Eugene Ganser died before 1995. Name Variation Daniel Ganser was also known as Dan. Daniel Ganser was the son of Christ Ganser and Genevieve Uslemann. Daniel Ganser married Nyla (?). Daniel Ganser died between 1994 and 2015. Married Name Her married name was Badger. Mildred Ganser was the daughter of Christ Ganser and Genevieve Uslemann. Mildred Ganser married (?) Badger. Mildred Ganser died before 1995. (?) Badger married Mildred Ganser, daughter of Christ Ganser and Genevieve Uslemann. Robert Brings died before 2015. Mary Dawn Honer was the daughter of John Joseph Honer and Audrey Hach. Mary Dawn Honer died before 2015. Joseph Honer was the son of John Joseph Honer and Audrey Hach. Joseph Honer died before 2015. Married Name Her married name was Holbrooke. Joyce Pulvermacher was the daughter of Robert P. Pulvermacher and Rose Mary Lins. Joyce Pulvermacher married Fred Holbrooke. Joyce Pulvermacher died before 2015. Fred Holbrooke married Joyce Pulvermacher, daughter of Robert P. Pulvermacher and Rose Mary Lins. Fred Holbrooke died before 2015. Marcus Hutter was born on 18 August 1970. He was the son of Judine M. Limmex. Marcus Hutter died on 29 June 1987 at automobile accident at age 16. Marilyn Harrison married Eugene Bauer, son of Alois A. Bauer and Margaret M. Hartl. Marilyn Harrison died before 2015. William Westphal married Selma Lattenstein. Married Name Her married name was Westphal. Selma Lattenstein married William Westphal. Married Name 11 June 1966 As of 11 June 1966,her married name was Schrank. Sharon L. Dietzel was born on 4 December 1943. She was the daughter of Hugo Dietzel and Charlotte Elizabeth Kleeber. 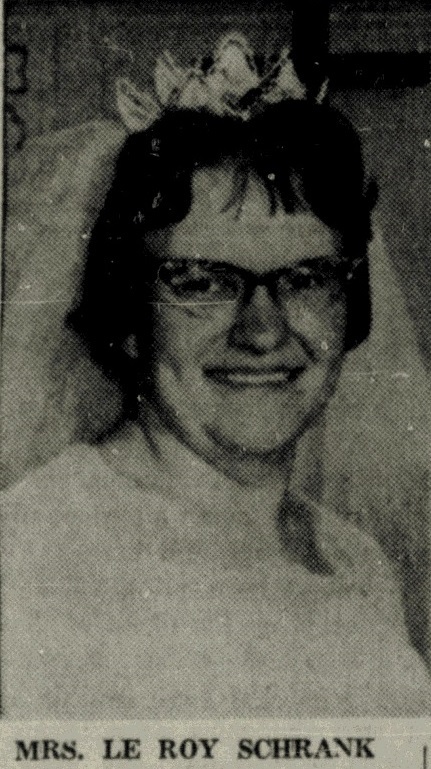 Sharon L. Dietzel married Leroy Paul Schrank, son of Paul Ervin Schrank and Alice Emilie Bertha Wagner, on 11 June 1966 at Reedsburg, Sauk, Wisconsin, Sharon Dietzel and LeRoy Schrank marriage announcement. 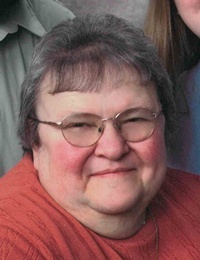 Sharon L. Dietzel died on 9 July 2015 at age 71 Sharon L. Schrank, age 71, of Reedsburg, died on Thursday, July 9, 2015 at Our House Senior Living in Reedsburg. She was born on December 4, 1943 in Madison, the daughter of Hugo and Charlotte (Kleeber) Dietzel. Sharon was a 1962 graduate of Webb High School. She was also a graduate of the Sauk County Normal School and UW â€“ Platteville. On June 11, 1966, she was married to LeRoy P. Schrank. Sharon taught kindergarten at Black Hawk and the Ironton & LaValle Schools for several years. She later worked at Kwik Trip until her retirement. Sharon was a lifelong member of First Baptist Church. She enjoyed teaching Sunday School and doing arts and crafts. 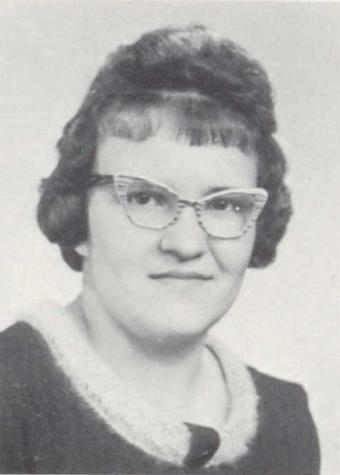 Survivors include her two children: Donald (Carrie) Schrank, of Madison and Betsy VanEtten, and her friend: Jeff Stevenson, of Reedsburg; three grandchildren: Emma VanEtten, Nicholas VanEtten and Rheya Schrank; three sisters-in-law: Alana Dietzel, Joanne (Rudy) Brandt and Birdelle Schrank, all of Reedsburg; other relatives and friends. She was preceded in death by her husband, LeRoy; her parents; her brother: James Dietzel; an infant sister: Karen Dietzel and a brother-in-law: Ronald Schrank. Funeral services will be held at 11:00 A.M. on Monday, July 13, 2015 at the First Baptist Church in Reedsburg with Pastor Bob Brandhagen officiating. Interment will be in Greenwood Cemetery. There will be a visitation from 2:00 P.M. to 5:00 P.M. on Sunday at the Hoof Funeral Home in Reedsburg. In lieu of flowers, memorials to the First Baptist Church would be appreciated. The Hoof Funeral Home is serving the family. Sharon L. Dietzel graduated in 1962 at Webb High School, Reedsburg, Sauk, Wisconsin. James Dietzel was born on 6 April 1945. He was the son of Hugo Dietzel and Charlotte Elizabeth Kleeber. James Dietzel died on 20 May 2015 at age 70 James H. Dietzel, age 70, of Reedsburg, was called to his Heavenly home on Wednesday, May 20, 2015 at University Hospital in Madison after an extended illness. He was born on April 6, 1945 in Madison, the son of Hugo and Charlotte (Kleeber) Dietzel. On June 18, 1983, he was married to the former Alana Wrezenski. Jim was a farmer for several years and later worked for Bou-Matic. Lastly, he worked at Schreiber Foods in Richland Center until his retirement. He enjoyed fishing, hunting, woodworking and reloading. Jim was a faithful member of the Advent Christian Church in LaValle. Survivors include his wife, Alana; three children: Steven Wrezenski, and his fiance, Shannon Quinlan, of Reedsburg; Kasey (Daniel) DeAces, of Smithville, MO and Elizabeth (Joe) Martinez, of Richland Center; three grandchildren: Noah, Miah and Chandler DeAces; his sister: Sharon Schrank, of Reedsburg; nieces and nephews; other relatives and friends. He was preceded in death by his parents; an infant sister: Karen Dietzel and his brother-in-law: LeRoy Schrank. Funeral services will be conducted at 11:00 A.M. on Tuesday, May 26, 2015 at the Advent Christian Church in LaValle with Pastor Richard Johnson officiating. Interment will be at the Greenwood Cemetery in Reedsburg. The family will receive friends from 4:00 P.M. to 7:00 P.M. on Monday at the Hoof Funeral Home in Reedsburg. In lieu of flowers, memorials to the Advent Christian Church would be appreciated. The family would like to give special thanks to the staff of University Hospital and the Reedsburg Area Medical Center for the excellent care given to both Jim and his family. The Hoof Funeral Home is serving the family. James Dietzel graduated in 1963 at Webb High School, Reedsburg, Sauk, Wisconsin. Karen Dietzel was the daughter of Hugo Dietzel and Charlotte Elizabeth Kleeber. Karen Dietzel died at died in infancy. Dolores L. Meyer was born on 15 September 1929. She was the daughter of Paul Meyer and Elsa M. Hasz. Dolores L. Meyer married Donald Meyer, son of Paul Henry Meyer and Lydia Mathilde Dorothea Harms, on 1 October 1949. Dolores L. Meyer died on 12 May 2015 at age 85 Dolores L. Meyer, age 85, of Reedsburg, died on Tuesday, May 12, 2015 in the Sauk County Health Care Center. She was born on September 15, 1929, the daughter of Paul and Elsa (Hasz) Meyer. On October 1, 1949, she married the love of her life, Don Meyer. Together they farmed north of Loganville and raised their family. After her family was a little older, she went back to school and received her GED, her CNA certification and then began her twenty year career at the Sauk County Health Care Center. After her husband died, Dolores worked for a few years in the kitchen at the Loganville School serving the children. She was a lifelong member of St. John Lutheran Church in Loganville, a member of the church choir, Ladies Aid, LWML and the cemetery board. Her hobbies included quilting, reading, spending time with her family and friends, helping with Orphan Grain Train and any other church work. She is survived by two daughters: Ellen (Darrell) DeMars and Lois (Dennis) Rose, both of Reedsburg; six grandchildren: Mike DeMars and Joni, of Loganville; Michelle (Kris) Lierman, of Reedsburg; Melanie DeMars and John, of Lyndon Station; Marcie DeMars and Brad, of Ironton; Daniel Rose and Kim (Chad) Leichtman, both of Reedsburg; six great-grandchildren: Gunther, Addie, Isaac, Olivia, Bryce and Ellie; her brother: Marvin Meyer, of Reedsburg; her sisters: Elaine Stageman, of Beloit and Margaret (Jerry) Christerson, of Tennessee. She is also survived by a sister-in-law: Louise (Richard) Kaun; brother-in-law: Jim Brown; daughter-in-law: Sue Meyer; half-sister: Emma Weible; along with many other family and friends. She was preceded in death by her husband, Don; son: Evan; her parents; an infant sister; her brother: Ray Meyer; sisters: Helen Stoughtenger and Alice Adams; numerous sisters-in-law and brothers-in-law. Funeral services will be conducted at 11:00 A.M. on Saturday, May 16, 2015 at St. John Lutheran Church in Loganville with Pastor Tim Anderson officiating. Interment will be in St. John's Cemetery. There will be a visitation from 4:00 P.M. to 7:00 P.M. on Friday at the Hoof Funeral Home in Reedsburg and from 10:00 A.M. until the time of the service on Saturday at the church. In lieu of flowers, memorials to St. John Lutheran Church of Loganville, Sauk County Health Care Center or Orphan Grain Train would be appreciated. The Hoof Funeral Home is serving the family. Marvin Meyer was born on 26 July 1928. He was the son of Paul Meyer and Elsa M. Hasz. Marvin Meyer married Dorothy H. Lutterman on 5 August 1949. Marvin Meyer died on 4 December 2016 at age 88 Marvin E. Meyer, age 88, of Reedsburg, died on Sunday, December 4, 2016 at Our House Senior Living in Reedsburg. He was born on July 26, 1928 in the Township of Reedsburg, the son of Paul and Elsa (Hasz) Meyer. On August 5, 1949, he was married to the former Dorothy H. Lutterman. Marvin was a farmer as well as doing construction work for over fifty years until his retirement. He was a faithful lifelong member of St. John Lutheran Church in Loganville any was active in Luther Laymen's League, A.A.L. and Orphan Grain Train. Marvin enjoyed watching sports on the television. Survivors include his three children: Kathleen (Tom) Genz, of Reedsburg; Richard (Laura) Meyer, of LaValle and Charles (Connie) Meyer, of Reedsburg; eight grandchildren: Brian, Dawn, Michael, Mitchell, Malissa, Steven, Amy and Sarah; thirteen great-grandchildren; two sisters: Elaine Stageman, of Beloit and Margaret (Gerald) Christerson, of Tennessee; nieces and nephews; other relatives and friends. He was preceded in death by his wife, Dorothy, on November 11, 2009; his parents; one brother: Ray Meyer and four sisters: Dolores Meyer, Alice Adams, Helen Stoughtenger and infant, Emma Meyer. Funeral services will be conducted at 11:00 A.M. on Friday, December 9, 2016 at St. John Lutheran Church in Loganville with Pastor Tim Anderson officiating. Interment will be in St. John's Cemetery. There will be a visitation from 4:00 P.M. to 7:00 P.M. on Thursday at the Hoof Funeral Home in Reedsburg. The Hoof Funeral Home is serving the family. Evan Paul Meyer was born on 3 August 1953. He was the son of Donald Meyer and Dolores L. Meyer. Evan Paul Meyer died on 1 November 2010 at age 57 Evan P. Meyer, age 57, of Deming, N.M., formerly of Reedsburg, died peacefully on Monday, Nov. 1, 2010, in his home following a battle with pancreatic cancer. He was born on Aug. 3, 1953, in Richland Center, the son of Donald and Dolores (Meyer) Meyer. Evan was a 1971 graduate of Webb High School in Reedsburg. On June 29, 1974, Evan married his high school sweetheart, Sue Ellen Kelley. He farmed and worked for Wisconsin Dairies for 22 years. He and Sue moved to New Mexico in 2001. Evan then began working for the City of Deming as assistant waste water operator and also worked in various other departments for the city until his illness. Following Tuesday's election in New Mexico, Luna County, an emotional Jay Spivey dedicated his District No. 2 win to his close personal friend, Evan Meyer. Evan enjoyed hunting, fishing and traveling. Survivors include his wife, Sue; his mother, Dolores Meyer of Reedsburg; two sisters, Ellen (Darrell) DeMars and Lois (Dennis) Rose both of Reedsburg; his mother-in-law, Jeanette Kelley of Reedsburg; his brother-in-law, Bill (Mary) Kelley of Iron Mountain, Mich; nieces and nephews; great nieces and nephews; aunts, uncles, cousins; special friends, Frank and Jill, Dave and Sherry, Ron and Mary, John and Sherry; and a host of other friends. He was preceded in death by his father, Donald Meyer; and his father-in-law, Kenneth Kelley. A Celebration of Life gathering will be held from 2 p.m. to 4 p.m. on Sunday, Nov. 14, 2010, at the REEDSBURG VFW HALL in Reedsburg. The Hoof Funeral Home in Reedsburg is serving the family. Name Variation Raymond P. Meyer was also known as Ray. Raymond P. Meyer was born on 10 March 1925 at Sauk, Wisconsin. Raymond P. Meyer died on 12 May 2011 at age 86. Married Name Her married name was Stoughtenger. Helen Meyer married James Stoughtenger. Helen Meyer was born circa 1933 at Wisconsin. Helen Meyer died before 2015. James Stoughtenger married Helen Meyer, daughter of Paul Meyer and Elsa M. Hasz. Alice Ione Meyer married Vivian Andrew Adams. Alice Ione Meyer was born on 11 September 1930 at Wisconsin. Alice Ione Meyer died on 10 July 2014 at age 83. Vivian Andrew Adams married Alice Ione Meyer, daughter of Paul Meyer and Elsa M. Hasz. Vivian Andrew Adams was born on 7 May 1929 at Wisconsin. He died on 14 June 1990 at Wisconsin at age 61. Name Variation Gerald L. Lehman was also known as Jerry. 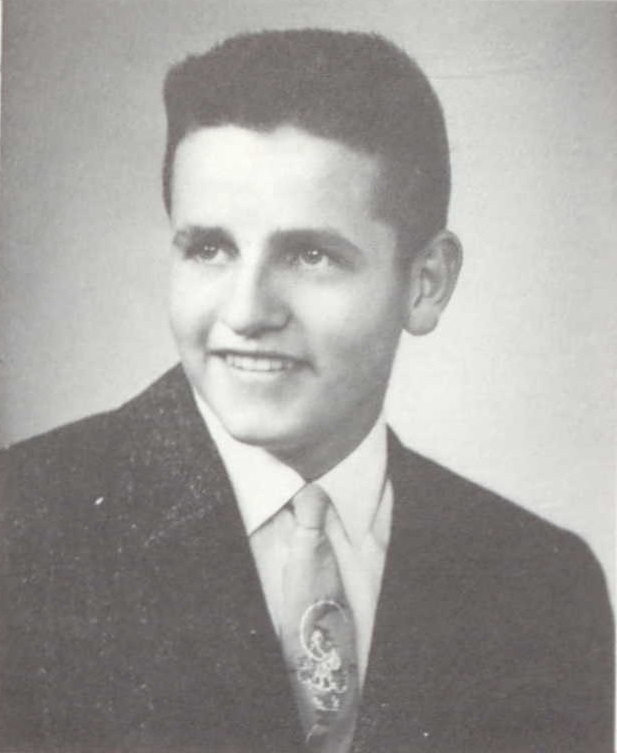 Gerald L. Lehman was born on 27 November 1945. He was the son of LaVerne F. Lehman and Hazel Montgomery. Gerald L. Lehman died on 19 October 2015 at age 69 Gerald L. "Jerry" Lehman, age 69, of Reedsburg, died on Monday, October 19, 2015 in the Sauk County Health Care Center from complications of a stroke. He was born on November 27, 1945 in Reedsburg, the son of LaVerne "Slim" and Hazel (Montgomery) Lehman. On February 10, 1968, he was married to the former Connie R. Luck. Jerry was a lifelong farmer in the Town of Ironton. He was a longtime board member for the Township of Ironton. Jerry was currently a member of the Sauk County Board of Supervisors. He was past president of the Wisconsin Cattleman's Association and past president of the Wisconsin Shorthorn Association. Jerry was a longtime board member for AMPI and was also a 4-H beef leader for many years. He loved attending national livestock shows. Survivors include his wife, Connie; two sons: Mark (Lisa) Lehman, of Frisco, Texas and Kurt Lehman, of Cazenovia; four grandchildren: Chase, Jack, Ben and Finley; his sister: Marlene (Russ) Glover, of Cape Coral, Florida; other relatives and a host of friends. He was preceded in death by his parents and a nephew: Todd Neises. Funeral services will be conducted at 11:00 A.M. on Friday, October 23, 2015 at St. John Ev. Lutheran Church in Reedsburg with Pastor David Glesne officiating. Private family interment will be held at a later date. There will be a visitation from 4:00 P.M. to 8:00 P.M. on Thursday at the Hoof Funeral Home in Reedsburg and after 10:00 A.M. on Friday at the church. In lieu of flowers, memorials to the Sauk County Beef Project would be appreciated. The Hoof Funeral Home is serving the family. 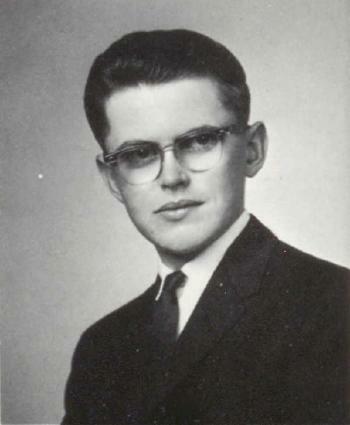 Gerald L. Lehman graduated in 1963 at Webb High School, Reedsburg, Sauk, Wisconsin. (?) Leake married Evelyn Raedel, daughter of Alfred H. Raedel and Ida E. Wawrock. Edward A. Schuette was born on 11 March 1934 at Wisconsin. He was the son of Arold Carl William Schuette and Dora Schlieckau. Edward A. Schuette died on 22 March 2015 at age 81 Edward A. Schuette, age 81, of Reedsburg, died on Sunday, March 22, 2015 at the Reedsburg Area Senior Life Center. He was born on March 11, 1934 in the Town of Westfield, Sauk County, the son of Arold and Dorothea (Schlieckau) Schuette. Ed attended Elder Ridge School and was a graduate of Reedsburg High School. From 1955 - 1957 he served his country in the U.S. Army. On October 19, 1957, he was married to the former Mary E. Roewer. Ed operated a dairy farm in rural Rock Springs for many years and later worked at Lands' End until his retirement. Survivors include his wife, Mary; three children: Scott Schuette, and his friend, Julie, of Madison; Lisa (Darrell) Schwandt, of Centennial, Colorado and David (Cynthia) Schuette, of Gloucester, Virginia; three grandchildren: Edward, Trinity and Maj-Britt Schwandt; four sisters: Gertrud Wilhelm, of Sauk City; Eunice Brenner, of Reedsburg; Merry Ann (Leonard) Hanusa, of Reedsburg and Dorothy Mae (Ed) Zobel, of Reedsburg; three brothers: Henry Schuette, of Reedsburg; Verlyn (Karen) Schuette, of Reedsburg and John (Darlene) Schuette, of McHenry, Illinois; nieces and nephews; other relatives and friends. He was preceded in death by his parents; his father and mother-in-law: Martin and Martha Roewer; and three brothers-in-law: Donald Roewer; Fritz Wilhelm and Henry Brenner. Funeral services will be conducted at 11:00 A.M. on Monday, March 30, 2015 at St. Peter's Ev. Lutheran Church in Reedsburg with Pastor Paul Crolius officiating. Interment will be in St. John's Lutheran Cemetery at Rock Springs. The family will receive friends from 2:00 P.M. to 5:00 P.M. on Sunday at the Hoof Funeral Home in Reedsburg and from 10:00 A.M. until the time of the service on Monday at the church. The Hoof Funeral Home is serving the family. 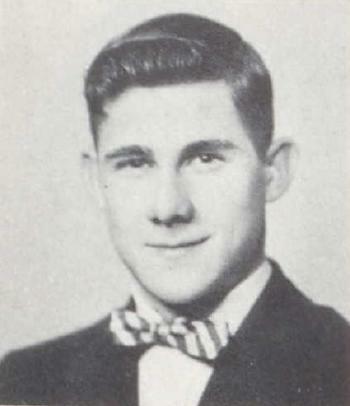 Edward A. Schuette graduated in 1953 at Reedsburg High School, Reedsburg, Sauk, Wisconsin. Fritz Wilhelm died before 2015.